What’s better than attending Photoshop World 2019? Winning an all-inclusive* trip that includes a VIP conference pass, party ticket, airfare, hotel, transportation and meals! 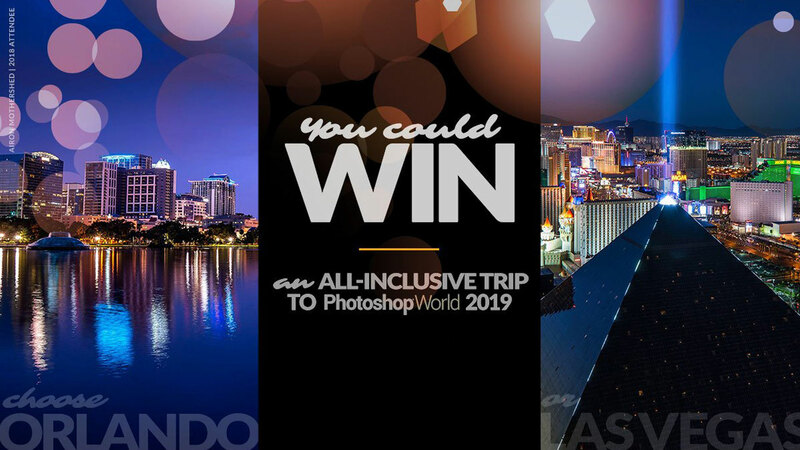 KelbyOne will be giving away an all-inclusive* trip to one lucky person interested in attending the photography, Photoshop and Lightroom conference of the year. In 2019, KelbyOne is back, hosting two Photoshop World conferences. The first will return to Orlando, May 30-June 1, 2019 and the second is in Las Vegas, Aug. 21-23, 2019. If you win, you get to choose which conference you want to attend. Photoshop World bringing hundreds of live sessions, hands-on events, vendor exhibits and photography opportunities taught by the leading trainers in the industry to thousands of attendees for three days of training, networking and fun. The contest is open to everyone, both current and new attendees. Click here to enter. Hurry, the contest ends Jan. 31 at 11:59 p.m. Good Luck!